The Sierra Madre Tattler! : Save The Arcadia Highlands Files a Complaint Against the City of Arcadia. Save The Arcadia Highlands Files a Complaint Against the City of Arcadia. Save the Arcadia Highlands has now filed a complaint against the City of Arcadia. This is being done in hopes of halting the imminent threatened encroachment of the kinds of aggressive mansionization that have overtaken much of the rest of that city. There are several key elements to this legal action, and we've broken them down for you here. The California Environmental Quality Act (CEQA) is a state law from the 70's that requires an environmental impact report for any new development in order to determine what is the consequences of the development are going to be, what are the concerns of the public are, and what can be done to mitigate the impacts on the environment. All development is subject to CEQA, however there are approximately 33 exemptions from this law, and one of them is Single Family Dwellings. There are also exceptions to these exemptions, such as "unusual circumstances" or "cumulative impacts." Save the Arcadia Highlands is arguing that a 6000+ sq. ft. house in a neighborhood that has an average size home of approx. 2600 sf, and 98% of the 850 homes are under 6000 sq. ft., is evidence that the 2 proposed McMansion projects are "unusual circumstances." Obviously these homes will have substantial impacts on the environment. These include traffic, utilities, schools and the aesthetic of the neighborhood. Save the Arcadia Highlands is also arguing that there is a cumulative impact on the environment when all the projects proposed in the last 2 years are taken as a whole, thereby creating a "development project" and not just two separate homes that happen to be immensely large. In addition, these projects do not conform to the City of Arcadia's General Plan, which has designated the Highlands as a "Very Low Density Residential" area. This means only somewhere between 3 to 12 people per acre. Replacement of these homes changes this density to 6 to 24 people per acre because proposed projects are 4 to 5 bedrooms. Additionally, in homes as large as the two in question, there are additional rooms that are "habitable." Meaning they are capable of being easily converted into bedrooms. These include studios, lofts, dens and home gyms. The Highlands voted to be a "Design Review Zone," Something that allows the neighborhood to determine what is "harmonious and compatible." This comes with the power to deny plans for new homes that do not conform. 2 years ago the City Council overturned a Home Owners Association denial, sending the message that HOAs could no longer deny because of size. Since then, the HOAs have been bombarded with development. Save the Arcadia Highlands has put together a great website that you can find by clicking here. You will definitely need to check it out. This group is on the front lines of a fight that even now is spreading over the city lines and into Sierra Madre. 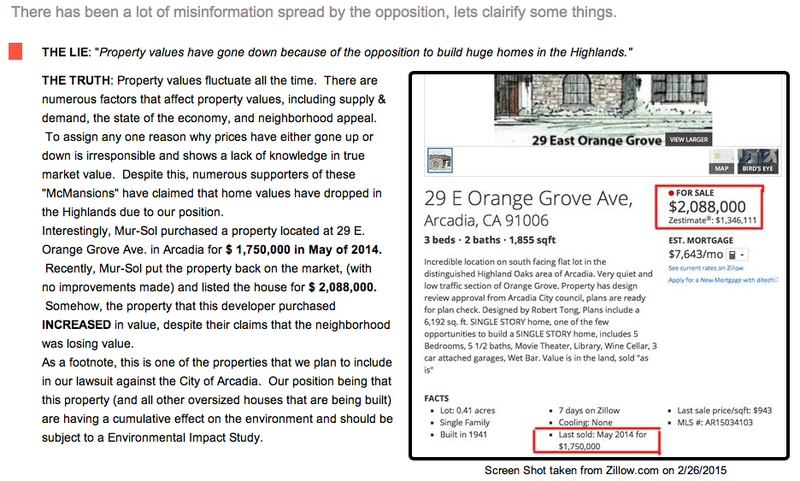 Here is an article from that site dealing with some of the disinformation being spread by certain parties hoping to turn the Arcadia Highlands into yet another unhappy McMansion zone. Good for Save the Arcadia Highlands. I'm sorry that it had to come to that, but their city council left them no other choice. Just for the record, the Preserve Sierra Madre coalition supports our friends and neighbors in the Highlands from predatory development. From Monrovia, to Burbank to many areas in Los Angeles, people are now saying no to those projects that create a windfall for the developer at the expense of the neighbors who find that the views, light and privacy they have enjoyed for so many years are suddenly gone forever. Preserve Sierra Madre supports private property rights. But when it comes between the private property rights of a developer who wants to change the character of a neighborhood vs. the private property rights of the neighbors adversely affected by some of these projects, we intend to stand with the neighbors every time. That's a good point Matt. Both sides have private property rights. This issue can be seen in alot of different ways. If you go to the beach, you will have people claiming that it is their right to play some loud music and subject everyone within earshot to rap music or some such thing. They don't care that other people may have a different taste in music. What about the rights of those who want to hear the ocean crashing on the shore. You go to a movie theater and some people feel they have the right to talk during the movie despite it preventing those around them from hearing the movie. Its the same thing as with the McMansions. They build these things because they say they have the right to do so on their own land. But they completely disregard the adverse impact it has on the neighbor's property values who just had their views blocked. This same selfish mentalilty can be manifested in many different ways. Let use this idea and declare a 'Design review & development- free zone' in Sierra Madre - all of it! 12:26, I wish Sierra Madre could go the way of Bungalow Heaven - the whole thing is protected. Benefits? A beautiful quality of life is protected. And for those watching the bottom line, property values go up and up. Just how much will a water meter in a protected area go for? The neighbors and the vast majority of the people in the Highlands don't want these two projects and its seems unfair to cram it down their throats. The Highlands has some great ranch style homes. If someone thinks they are too small, do what people used to do. Buy a bigger home somewhere else. Don't tear down what's already been there for 50 or 60 years. All this tear down stuff is madness. It used to be that buyers should shop for homes until they found one that suited the needs of their family. Sure, you can make some modification and add a room here and there. But this knew trend of tearing stuff down is awful. I guess its mostly developers who are doing this. The only way it makes financial sense for them to tear down an existing home is if they can build a substantially bigger home and make up for the expense of tearing down the existing home by the spread between the cost to build and the value per square foot of the finished home. So the only way the developer can do this is to screw over the neighbors by building a McMansion. If Arcadia had some reasonable rules in place to curtail the size of home you can build on a given lot, you would see alot less teardowns. That's the key. Reasonable development is ok that respect the neighborhood. Cramming 6,000 square foot plus homes in a neighborhood with 2500 square foot homes is rediculous. I would like to see the developers sue these cities, to enforce their property rights! That's right 6:39. Property owners have rights.....including those neighbors who are damaged by the McMansions next door to them. The Highlands HOA are the ones that need to be suing. Right. Homeowners are not property owners. They are the people who get in the way of property owners. Fap! Mur-Sol specialized in the biggest homes possible. They and to a lesser extent the Bowdens are banking that people wake up from their slumber too late. Thanks to the Tatler, Preserve Sierra Madre, Save the Arcadia Highlands and other nearby groups, they are going to have to leave the state. Hey Groh's and Browdens, we don't want your McMansions that are built at our expense! Make your money somewhee else! We're on to you now. Greed won't win. The Highlands HOA may lose this battle but they will win the war if they band together and fight this before McMansions gain a foothold up there. Well said, 7:37 - and isn't there still a chance that they will not lose this battle? This might be the first time in decades that developers in Arcadia have had to consider the property rights of home owners who aren't their clients. I think they will win. There is a reason they have an HOA. A city council can't just disregard them like they have done. I'm going to put my money on the Save the Arcadia Highlands group to beat this back. After the fiasco with the junket to China the Arcadia City Council is in no position to be beligerant. The City Council and the City Staff know who butters their toast and they vote accordingly. That God the residents over there have finally woken up to what's going on. They might be able to save the Highlands - but I think it's a pretty good bet the rest of that once-nice town is toast. That makes the northernmost area all the more precious! The Highlands will be like the Alamo - besieged on all sides. If they stay united and are organized and if enough people care and help out, they can prevail over the developers and the realtors like Reni Rose and Alan Black who want to ingratiate themselves with these developers in order to get the fat commissions. I really admire the Save the Arcadia Highlands group for standing up for their rights. It will be great to watch their efforts. At some point, some of these groups need to join forces to compare notes on the best way to stop this stuff. Funny to think that the Arcadia Highlands people work for Arcadia, while those in city hall work for certain offshore entities. That's great that the Highlands is fighting back. I'm glad the Tattler outed Reni Rose's support for the developers like Mur-Sol and Bowden who want to build the McMansions. 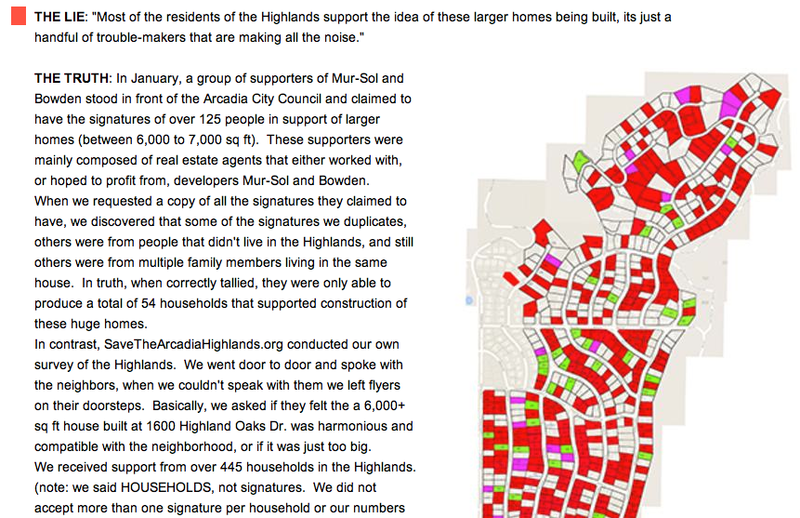 According to that petition that a few people signed supporting the two McMansion projects, it says that the signers will "continue to support progress in the Highlands.". I'd like those realtors like Alan Black and Reni Rose to tell us exactly what they mean by that. What kind of "progress" do they support? I went to the Save the HIghlands website and I really feel for these people. They were living peaceful normal lives and now they have to spend their time and effort trying to preserve what they've enjoyed for so many years. I'm also angry that realtors like Reni Rose, Alan Black and others can cavalierly sign that petition that influenced the city council to overturn the HIghland's HOA's decision to reject the projects. That's disgusting to cause all those people over there anxiety and angst as they now have to spend their time to fight this battle all because the likes of Reni Rose and Alan Black hope to curry favor with developers like Mur-Sol and Bowden so they can get another real estate commission. Disgraceful! expense. Those realtors should be black-balled from ever doing any business with any owner of property in the Highlands. Since all they care about is money, send a message to these realtors that there are alot more of your average homeowners than there are developers and let the realtors decide whose business they want to lose. 7:08, you sound like an experienced preservationist! It is a shocking amount of time, energy, and angst that these struggles cost - and the development industry and its enablers know it, and use that fact to wear communities down. People get exhausted from the committment needed. But hanging in there pays off. We still have a small town, and most of it is human-sized. For the time being. What kind of people will sign a petition that screws over their neighbors so that they can make some money. I just don't understand it. I guess if money is the most important thing in your life as it appears to be for Reni Rose and Alan Black, then I guess they can do it. I don't like it but its a free country. What we can do though is call them out on it. Thanks Tattler for uncovering the realtors who signed that petition. You did a public service. Maternity hotels,fraudulent bible colleges with student visas for sale and,money laundering,... Why should we care where the money comes from as long as the developers get paid and city government gets a new tax base . Idealists need not complain your complaints don't line my pockets ... Money talks,complainers just whine . Things are too crazy in Arcadia. Next thing you know you will see massage parlors and maternity wards in Sierra Madre. Things have started in Sierra Madre but we are getting out ahead of it. When Gene Goss and Glenn Lamdin and that architect Vanderweldt say that we don't have a big problem right now in Sierra Made, they are probably right. But at one point in the not too distant past, Arcadia didn't have a problem either. But now in looking at Sierra Madre, you have developments proposed for One Carter, Stonehouse, Elm Street, the Monastery. You have the huge monstrosity already built over on Mariposa. You have Camillo and others. So it has started in Sierra Madre that's why we need to get out ahead of this. This is a very interesting development. Mur-Sol and Bowden are now really threatened. They could afford to have to sit back and wait on projects in funky little Sierra Madre, and had some in progress that would keep the money coming in, but Arcadia has been their faithful cash cow. They are going to get aggressive over this one. Sierra Madre's commitment to slower and more carefully reasoned development is not something they want to see go any further. The developers and realtors have the best city council they can buy! It's too bad they missed their flight. Most people are trying to leave mainland China. Why would they go there? Mur-sol and the Grohs have had a free ride for awhile now getting rich by destroying neighborhoods with their oversized McMansions. Those days are now over. The developers and realtors will get together and pass around petitions and such to try to contain this outbreak of hostility but I don't think they are going to be successful. Too many people are now tired of all this tearing down of homes and replacing them with over-sized homes on smaller lots. 9:20AM The fight is just beginning. Every member of Preserve Sierra Madre must stay vigilant. Read every city council agenda, read the planning commission agenda, read the city managers weekly message. Demand that recent building permits be published, CUP requests be published AND THAT THEY ARE ACCURATE. Watching city government has become like going to the market-a regular occuring thing. I remember a meeting where the Mur-Sol guys got up there and complained that they weren't advised about the water meter moratorium before they bought their lot they wanted to split. We need to advise them? The gall. Write those letters, ask questions, etc. There are many things we can't do a lot about, preserving what we have in Sierra Madre isn't one of them. 10:27 is right. Although alot of things are going our way in Sierra Madre, we have to remain vigilant. As much as I favor what the people are doing in the Highlands, they should have mobilzied when south Arcadia was getting razed to the ground. I guess better late than never but, once the development interests get intrenched in city government as well as in the City Council, it makes it that much harder. 10:27, great to-do list! I heartily agree. Always keep in mind what every town would look like if you gave the developers a free rein to do what they want. They are usually never preservationists because it cuts into their income. That's goes for most of the realtors, contractors and architects. So when they speak up at meetings, just remember why they advocate for certain posiitons. When is the City going to report on what they're doing with all the Development Impact Fee $$ they are receiving? Or does it just go to the Platinum Pension account? After they gobble it all up they burp. You're right, it was the Bowdens. Thank you! Q: What do you call an Irishman in the knockout stages of the World Cup? Q: What is Irish diplomacy? A: It's the ability to tell a man to go to hell so that he will look forward to making the trip. 10:27 - You are so, so right! We must remain vigilant. The fight is never ending to keep our funky Sierra Madre the town we want to live in. Several of us have been fighting the developers since 1999, some even longer, and it does get tedious, but we are winning! Please Tattlers, send today's Tattler link to all the Arcadians you know, so that they know they are not alone. I wonder if it would be wise if those of us who are interested in saving SM and ARC should plan on supporting the Highlands would band together and show up at their CC meetings. They need the support and after all they are our neighrors. Those realtors would get a whif. Then perhaps they would support us. I agree 5:58, there can be the opportunity for some concerted action at some point. The Save the Highlands group needs to put together a database as soon as they can and send out News Alerts like Preserve Sierra Madre does. Those alerts should include Tattler articles, Mountain Views News and Star News articles when they cover it. Developers count on people not knowing what is happening right beneath their nose. When you shine a light on it, people get aroused. They just need to know about it first. Save the Highlands needs to get that list of supporters as fast as they can even if it means knocking on doors. They need their own Anne Chesterman to ride around town on a bicycle to warn people what is happening. Totally agree 5:38 PM and 7:30 PM. To many residents in the Arcadia Highlands, it seems that the area is located closer to Sierra Madre than to the south part of its own city. The developers are now looking into these two neighboring places trying to do what they've been doing for a long time down in the southern part of Arcadia. FYI, there is no HOA for homes located in a small area right next to Sierra Madre, i.e., the area that is north of Orange Grove Ave and west of Santa Anita Ave. Projects in that area gets approved easily since developers only need to go through the city for approvals. Los Angeles Times B5, 3/16/2015 "Burbank to draft housing limits."